The Photography department welcomes Gary Metz lecturer Curran Hatleberg (b. 1982), who earned his MFA at Yale University in 2010. His work has been exhibited nationally and internationally, including recent shows at MASS MoCA, Higher Pictures and Fraenkel Gallery. 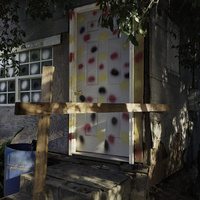 Hatleberg has taught photography at numerous institutions, including Yale University and Cooper Union. He is the recipient of a 2015 Magnum Emergency Fund grant, a 2014 Aaron Siskind Foundation Individual Photographer’s Fellowship grant and the 2010 Richard Benson Prize for excellence in photography. His work is held in various museum collections—including the SF MoMA, the Center for Contemporary Photography, the Davison Art Center at Wesleyan University, the Williams College Museum of Art and the Yale University Art Gallery—and has been published frequently in such periodicals as Harpers, The New Yorker, The New York Times Magazine, Vice and The Paris Review. Lost Coast, his first monograph, was released by TBW Books in fall 2016, and Somewhere Someone, a collaborative artist book with Cynthia Daignault by Hassla Books in fall 2017. His work will also be included in the upcoming 79th Whitney Biennial in spring 2019.